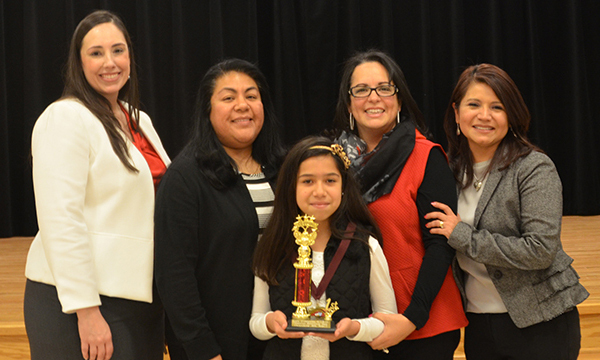 Olmito Elementary fifth grader Grecia Benavides was crowned champion of the 13th Annual Los Fresnos CISD District Spelling Bee Saturday, January 28th, at Los Fresnos United. The championship was the second for Benavides in three years. In 2015, Benavides also won the District Bee as a third-grade student. Benavides now advances to the Regional Spelling Bee to be held March 4 at South Texas College in Weslaco. The winner there advances to the National Spelling Bee in May at Washington D.C.
Two spellers finished tied for second place because they were eliminated the same round. They were Andrea Iturbe of Resaca Middle School and Sabrina Castro of Olmito Elementary School. Iturbe, a seventh grader, was competing in her third Spelling Bee. She previously competed in 2014 as a student at OES and in 2015 at RMS. Castro was competing in her first Bee. Finishing in fourth place was Sydney Jo Peña of Los Fresnos Elementary, who was competing in her second Bee. She finished in second place last year. GRECIA IS MY FRIEND FROM SCHOOL AND SHE IS 12 NOW!!!!! !